Serena and I took a swing through the Gewürz block of the Floodgate Vineyard today to see how bloom was progressing. We’ve had a long cool spring and so bloom was delayed approximately ten days. Also we’ve seen rains moving through recently. We’ll have to come back and check to see what pollination rates are for various blocks but I expect there to be a slightly reduced yield. It’s a little tough to see but in the photo you can see the bloom. Grape blooms aren’t very showy really but they self pollinate so they are very efficient at making sure they set a solid crop in the right conditions. The rains tend to make some of the caps stick shut so they don’t pop open to be pollinated. This condition called shatter produces a cluster with missing grapes. We’re not worried at all about these Gewürz grapes because a loose cluster has less tendency to hold moisture which could cause mildew. Also we’ll have to drop less fruit to balance the fruit to canopy ratio later in the season. We’re quite please to see an even set of potential cluster. We’ll get an update posted as soon as we can see the berries coming to size. 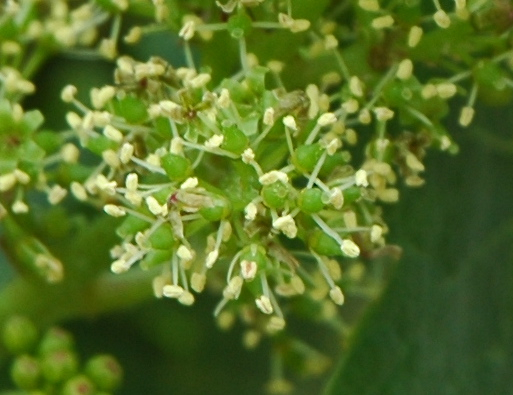 In the picture below you can see what look like tiny grapes but they are really clusters with the caps still covering the blooms. These are the caps we want to be dry so they pop off and expose the bloom for pollination. Next post: Cartograph’s release in T-minus 9 days ….